Please purchase authentic materials directly from the author. Be aware! 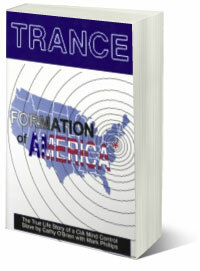 Continuous reports of free internet pirated/counterfeited pdf copies of our books containing deliberate misinformation are rising at an alarming rate. This deliberately generated misinformation is intended to dilute, distort, and undermine our whistleblowing efforts on Truth that makes u.s. free. 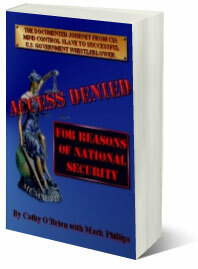 Therefore any/all eBook copies of TRANCE Formation of America and/or ACCESS DENIED For Reasons Of National Security are NOT AUTHORIZED and LICENSED aside from Kindle. PTSD:Time To Heal is a self help workbook and therefore is avaliable in hard-copy only.